The one that I totally didn't expect him to love, however, is ngmoco's Touch Pets: Dogs. 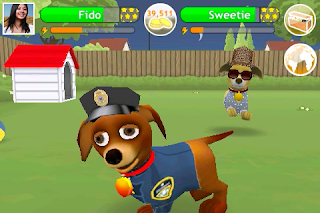 It's a little virtual pet game for iPhone that is really quite simple and a direct rip-off -- and vast improvement on -- Nintendogs for the DS. You visit the dog daily to feed him and give him water, take him out to the yard for exercise, care for his hygiene, change him into cute outfits, etc. Alex LOVES all these activities. He seems, especially, to relate to the dog's need to be let outside every day to poop. That's always his first priority after booting up the game, and he is very conscientious about cleaning up the poop. He also loves feeding the dog and giving him water, and washing and brushing him. It's so much fun to see how such a tiny human, who can do so few things on his own, can understand and use the intuitive interface (I credit both ngmoco and the iPhone itself--and, of course, my brilliant child). The cutest part for me, though, is what Alex calls the game. He asks for my phone, then tells me, "Let's play Wii Dog." When we're done with all the tasks in Touch Pets, he says, "Let's play a different Wii." It's amazing -- to this child, "Wii" = "game." Even though I should probably correct him (for the sake both of literacy and of fairness to the other consoles ;), I find myself just letting this one slide and enjoying this simple time when one child's entire view of video games is formed by his early life experiences with Wii. That stands for November Non-Blogging Month... I can't believe there was a time when I blogged every day in November. Now it's an accomplishment to blog every month! And though I don't think this really counts as a post (I have a few topics I really want to cover but just haven't had time! ), I'm hoping it'll at least get my editorial juices flowing again. I'm busily gearing up for Thanksgiving, which I'll be hosting again this year at my house. It's going to be a potluck and gamefest with family, friends, and Beatles Rock Band. We might also break out New Super Mario Bros. Wii, though since Shoe will be in attendance, it might turn too competitive. We'll see. I've only recently checked the game out, and I will say that playing cooperatively is really fun--I love how you can bubble yourself out of tough spots, as long as you're playing with a more skilled friend. I haven't gotten to a point yet where I've needed to use the hand-holding Super Guide, though I am really curious how that will work out. I accidentally played a level in Uncharted 2 on their Super Easy mode, and I was shocked how they sort of shuttle you forward if you fail in any way. Very jarring for an experienced gamer--I wonder if this actually attracted many non-gamers into Uncharted. Oh, and in other news: I'm pregnant again! This is kind of a weird venue for that news announcement, but nowadays, what really is the best way to share such info? I'm due in February and looking forward to it, though if I think I'm busy now, I shudder to think what awaits me then. So let's not think about it and instead just try to enjoy this moment of quiet and calm when I actually managed to blurt out a few words to the world. Now, on to Mass Effect! I'm replaying it to get a character ready for import into the next game (I never played the original on retail because I reviewed it). I'm hoping they let you change your character's looks though--I really don't like my current incarnation of Ms. Shepard. Lately there has been a LOT going on in my life, more than I can talk about openly, and more than I think I've ever experienced all at once. Every time I think things are settling down, a new wrench gets tossed my way (I even have mysterious bruises that are possibly evidence of these "wrenches"). Not all of it involves just me, which is why I really can't share details, but I hope it explains just a little bit why I haven't been writing much of substance here. I've also realized how difficult it is to use the social networking sites to express one's true feelings. Facebook really needs to add a "share only with the people who won't judge you when you say you are depressed or stressed or feel like crap" button. But anyway, it's been a while since I wrote, and I just felt like putting something -- any words, really -- out there. And I'll leave you with this very important Bill Moyers' piece about the health insurance industry -- just watch the first few minutes for a reminder of why reform is necessary. In this economy, I hope more and more people are realizing how very precarious employer-based health insurance is. I really liked Katie Couric's show tonight on Walter Cronkite. It's truly the most appropriate format for an obit on this legendary newsman. I really hope Cronkite's standard of journalism isn't dying. Some would argue that it's already dead, but I don't agree. I think things are simply evolving and adapting to some seriously disruptive technological changes. The love of truth and representing important issues and stories to the public is what drives real journalism, and I can't see human beings ever surviving without that. I hope I'm getting this just in under the wire of relevant Michael Jackson posting, because it has got to be said. Every time the question of Michael Jackson's kids' paternity and custody comes into question, somewhere an adoption angel dies. Really. I've really been wondering how adopted (or any non-traditionally conceived) children feel when they hear these newscasters pondering that because Jackson may/may not be the biological father to those children, it's just a complete MYSTERY who is going to take care of them now that he's gone, and really, to whom do these kids belong? It's ridiculous. Why should his kids (which I assume are legally his kids, especially if their mother relinquished her parental rights) be treated any differently than any other kids whose parents/guardians die? To say that they should be treated differently because they might not be genetically related to their father is such outright ignorance and stupidity, and I can't believe how glibly it keeps getting stated and questioned over and over again. The other thing that has been nagging at me is this question of whether the kids are his, based completely on their looks, and whether there's any way those kids could be half-black. I thought we had come farther than this as a society, I really did. I mean I grew up with people questioning whether my dad was really my dad, questioning whether I was really Chinese, etc. and I never really held it against anyone. Back when I was growing up -- believe it or not -- multiracial marriages and mixed children were still quite unusual. But nowadays it is so obvious how quickly "dark" genes can get diluted. I'm not saying it's the norm, but it can happen in a single generation. Genetics are weird, and there's so much living proof of this fact that it is simply ignorant and embarrassing for people to insist that there's just no way those kids could be half-black. That's simply not the case. I'm not gonna go on record and say I think they actually are half-black, because frankly, Michael Jackson's life and ways give me plenty of reason to believe that they might not be genetically related to him at all. But to be so ignorant of the reality of mixed ethnic heritage in the multicultural era in which we live makes you painfully out of touch. 1) Did Luchina Fisher, the author of this story, and whoever edited it get a serious talking to? Will an apology be appearing for this frankly racist "news" article? 2) If not, then when are you guys going to do a retrospective on my life growing up as the one "white" kid dealing with an all-Chinese family? The language barrier! The hair color! The pressure to do well in school! The chopsticks! Oh, the stories I can tell! If only I'd realized earlier this was breaking news! Race in this country is a complicated issue, and judging by how contemporary media are handling the strange, sad, unusual story of Michael Jackson's life and death, it's clear that whatever progress we so celebrated when we elected our first black president back in November was -- important though it may have been -- still just a baby step toward combating our tribal, xenophobic, and prejudiced human nature. I've been playing this game against my will lately. My niece and nephew adore it, so I've sort of been peer-pressured into playing it on Alex's behalf. He's not quite old enough to play it on his own, but he is old enough to appreciate it and understand that he and his cousins can play it "together" online, visiting each other's towns and such. We all know the <3 emoticon denotes love. What's the opposite of that? See, I've played the previous Animal Crossings, on Gamecube and DS, pretty extensively. I've already paid off multiple mortgages to Tom Nook and filled numerous museums with dinosaur bones. I've shaken trees and conversed with town inhabitants ad nauseum. Even the hottest show in town, KK Whatever-his-name-is on Saturday night, got boring years ago. So this third time around, enduring all of Animal Crossings odd quirks (the endless dialogues, the not-quite-exact enough controls, the lack of new content or gameplay) doesn't feel quite as rewarding or enchanting as it was, especially, the first time around. The game makes you pay a steep price -- especially if you want to go online. I knew about friend codes, so I was expecting that part. I wasn't prepared for the fact that, before you can even get your damned friend code, you need to complete your first round of odd jobs for America's favorite predatory lender Tom Nook (which happens to involve having lengthy conversations with every bleepin' animal in town). Then, once you have all the friend codes (and every human player needs his/her own code -- fun fun fun! ), you have to be online simultaneously, with your gate open (a setting which requires a save and restart to change) and Wi-Fi firewall settings fixed just so. For some reason, I had a ludicrous notion that I'd be able to mail letters to another friend's town, but I couldn't get that to work. I mean, there's absolutely no way in hell you are ever getting Animal Crossing set up online without also having to be on speakerphone with the people you are trying to contact, which just seems ridiculous. What's the opposite of <3 again? But when we finally succeeded, and Alex's cousin made her first exuberant foray from Pretty town into Gearland -- with Wii Speak enabled and everything! -- I've got to admit, this game that has frustrated me so, the game that has been shoveled from system to system with the most minimal of effort, became magical all over again. My ennui evaporated and I was full of <3! I'd still like to know the other emoticon, though. Alex and I haven't even made our first mortgage payment to Nook, and given how he always gives us an earful even for the simplest transactions, things are bound to get ugly. "NO! MINE! [pause] Thank you!" There are few more classic symptoms of the terrible twos than this phrase, which Alex has started saying lately. He doesn't so much say it as he does bark it like a dog trainer or German soldier. It's so curt and stern-sounding that it is obvious if it were being typed, it would be in ALL CAPS. It's mostly uttered in reference to a cherished toy or piece of candy, and it's usually said in the expected context -- if he fears something is going to be taken away from him, either by us or by another child. We're trying to cope with this as we have any of his other "terrible" stages -- correct when possible, ignore when necessary, divert and distract when all else fails. "NO!!! MINE!!!" Then a pause. Then, in the sweetest, most polite tone of voice ever, a chirpy little "Thank you!" Mind you, Alex said this to nobody in particular. When he was playing all by his lonesome, with unchallenged access to every single one of his earthly possessions. The little guy may be in his terrible twos, and he may be developing a real sense of territorialism. But you can't say he isn't being polite about it. I never thought I had the potential to become a chocolate snob, because I'm really not much of a fan of dark chocolate, and everyone knows that dark chocolate is the finest chocolate and people who have fine tastes prefer dark chocolate. My husband is one of these people. He won't even eat Hershey's Kisses! I've always been pretty open-minded about chocolate, though I'm also not someone who really obsesses about it in any way. So I was very surprised the other day when, at a work function where I had access to a giant bowl of candy bars, I ate a Kit-Kat and found myself completely not enjoying it at all! The chocolate just tasted...weird -- synthetic almost. I need to dig a little deeper to find out if they changed their formula or ingredients. I mean, Kit-Kat has always been one of my faves -- I'm fine not being a chocolate "snob," per se, but I'd hate to think that for most of my life I had genuinely bad taste! Read the story of the little robot who made it! Twitter drives me crazy. I'm not saying I'm not drawn to its infectious, somewhat addictive nature. But I realized recently that for me, Twitter is a lot like cigarette smoking, and social smoking in particular. I want to do it -- all my friends are doing it, and it looks rather cool. Everyone's talking about it -- it's all over the blogosphere and news, and it certainly seems like the "thing to do" of the moment. But when I actually sit down in the bar and light up a Twitter account, first of all, I find I don't actually enjoy its strange, abbreviated form of oversharing. Then I realize I'm surrounded by fumes and totally can't control which ones invade my consciousness -- it's pretty much all or nothing. And then even after I've left the bar, I can't get the smell out of my hair. If I had an addictive personality, I'd probably be coming back for more (luckily, I don't). Yup -- Twitter is the new smoking. Anyone with a personal blog already understands the desire to share one's thoughts with the world. Individual reasons vary beyond that broad, overarching goal. I started this blog as a way to motivate myself to formulate my random thoughts into somewhat coherent written essays and vignettes. Over time, I realized it was a great way to keep in contact with long-distance friends and family. And now that I've moved on from EGM and 1UP, of course, it is a way to keep in touch with the community of gamers and friends I made along the way. A bonus is being able to share my thoughts and knowledge with people typing particular keywords into search engines. So, lots of good reasons, if I may say so. Facebook enabled me to share my thoughts in a more automated manner with many of the same people. I call it "automated" because Facebook's format means you can be expressive without actually having to come up with a thesis, developing arguments, and a conclusion. You certainly don't need to be articulate, and even proper grammar and spelling is rather optional. Plus, what with superpokes, photo tagging, chain-letter notes, having the Bigger Brain or Word Challenge score, and the like, Facebook gives you words when you can't think up any of your own. And often, those means of communication end up being much more effective than a beautifully penned treatise. Sure, you could come right out and say, "Hey, we were good friends once, and I've thought about you a lot over the years. I'd love to reconnect and keep in touch, but don't expect to hear from me very often because obviously I have a pretty busy life. Still, that doesn't mean I don't care!" But that's so direct, emotionally honest -- even confrontational. It's much more humane to just invite your old friend to play Scrabble once in a while, occasionally noting in the chat how cute their kids are or how you've been stressed out at work lately. Better yet, you just challenge them to an '80s movie trivia quiz and remember fondly the slumber parties where you watched all those movies together. I appreciate Facebook for this ability to make connecting with friends less emotional, less articulate, less carefully thought-out, and it's been a damn near miracle how it's reconnected me with people I thought were totally gone from my life for good. And then there's Twitter. To me, Twitter is like a double-derivative. You take the derivative of blogging and you get Facebook. Then you take the derivative of Facebook and you get Twitter. It's all that oversharing boiled down again and again to its most addictive, infectious essence. I've noticed this among my circle of friends. You had the early smokers -- the ones who got right into Twitter and really enjoyed the up-to-the-minute newsiness of it. Then, just the way so many otherwise healthy-living, conscientious folks will smoke cigarettes socially, Twitter started to ensnare friend after friend into its weird, stream-of-consciousness blabbing. The difference for me between Twitter and Facebook or a blog is that I often care what people write in those other two forums. I really like reading people's blogs, because they often have some thought and care put into them. And Facebook is a nice way of recounting the overall ups and downs of ordinary life. But Twitter gives people a little too much freedom in recounting a few too many ups and downs. Like, bodily functions, people? Really? It's also taken the questionable grammar practices of 1337speak and Facebook and put them front and center, to the point where it seems people are almost trying as hard as they can to write 140 characters of broken English. And it's made this whole @soandso format seem like an almost normal way of referring to your friends. Like, "Yeah, what'd you do this weekend? Oh I changed @Alex's diaper and did @Nick's laundry. Went out to breakfast with @Grandparents and then took @Fido for a walk." It drives me crazy. Obviously, Twitter is not going away, and luckily, it's a hell of a lot healthier than smoking. But it's also lucky I don't have an addictive personality, and though I do give my occasional update on Twitter, I think for now I'll stick with my other two primary avenues for oversharing. An hour was all it took for me to decide that I was utterly uninterested in Mirror's Edge. But I couldn't help but feel that I should keep on playing for at least a few hours before I could authoritatively state that I hated it. Perhaps this is a vestige of my life as a member of the (modern-era) EGM Review Crew, when we took game reviewing so seriously we would never consider forming final opinions on a game until we'd damn near finished it or at least made sure that we'd seen all of what the game had to offer. But really, how long should you have to play a game before you can determine whether or not you like it? The closest analogy I can think of is reading a book, where you often have to give it 50 or 100 pages before you really get a sense of the story, characters, and depth. Writing style is apparent and may be immediately engrossing or off-putting, but the more macro aspects of the book take a while to develop. With Mirror's Edge, though, I felt pretty immediately and consistently throughout the first level or two that I was basically going to hate almost everything about the game. The world was kinda interesting architecturally, and the cartoony graphics were pretty cool. But I hated the voice actor who played Faith. I hated the story line and the silly tomboy runner who was showing me the ropes in the tutorial. I hated the first-person perspective and not being able to see my character doing all these ostensibly cool parkour moves. I hated the fact that the game made me use my left hand more than my right. I hate the constant insta-death scenarios. I hated how long it took to reload after you died. I hated being chased by "blues" shooting me. I hated that my reflection didn't show up in glossy windows except during the scripted parts. At a certain point very early on (right after Faith kisses her sister goodbye in awkward first-person view and then has to outrun a bunch of cops), I decided that there was absolutely no reason for me to continue playing something I was hating so much. But still, I can't shake that nagging feeling that I haven't played enough of the game to truly see whether I've made a fair judgment about it. I know quite a lot of people who'll beat games they don't even like, but they too are all former reviewers. I also remember playing a bunch of games during my time as a reviewer where you get used to the controls or the camera and then the game starts to be not so bad (though I've rarely seen games go from seeming bad at the beginning to becoming really good eventually -- only from bad to OK). But since Mirror's Edge was rated fairly high (wasn't it? ), I am wondering if I missed the point or something.... Did it get really good a few more levels in? Unless you enlighten me, we'll never know, because after 2 levels and 30 achievement points, I'm done. I probably would have blogged sooner after the inauguration, but that day, moments after Obama was sworn in, I learned of layoffs happening at my company. I was very, very lucky to have been spared, but that was a difficult week in general. It's hard seeing people lose their jobs, even if you don't know them too well. So I was feeling rather uncommunicative for a while afterward. Life moves on, but these are dark days indeed. Not a weekday passes when you don't hear about another company shedding dozens, hundreds, maybe thousands of employees. I don't care how few it is or how justified the expense may be; my heart goes out to those people. I've been unemployed before, and that period goes down as one of the toughest in my life. The money problems might be the most tangible, but losing one's place in one's career and one's sense of immediate purpose are, in my opinion, much more damaging. The good thing about unemployment is that it does end. Some day, some way or another, you're gonna work again. It's too bad it's nigh impossible to enjoy the time off when you have it, but that's just one of those harsh realities of life.